What happens when everything you know is about to be taken from you? What can you do when you have to leave the only place you call home? Where do you go when you get tired of hiding, but too scared to run? What do you do when you’re not sure if you’re a victim or a criminal? These are just some of the barriers that young undocumented immigrants must confront. In the multimedia play Undocumented by Katherine Chua, she highlights the inner turmoil of a girl called Frida, who has been found out by the authorities as being in the country illegally. Although she has been living in the U.S. since the age of 8 and is now 25, she will be taken from all she's ever known and deported "home" to her native country. The only light is the possibility of having the DREAM Act bill get passed by legislation. But before Frida can find solace and trust in this bill being past she must find solace, trust and forgiveness in those around her and most importantly herself. Currently Touring and Accepting Invitations. HerCircleEzine.com is an online magazine of women’s creative arts and activism from around the globe. By celebrating artists and writers whose work addresses the social issues of our time, we strive to bring these issues to the fore, whilst reaffirming connections between art, politics, and life. Artists and writers featured in HerCircleEzine.com use their work as a means of addressing identity, gender, ethnicity, politics, and statutes that surround and shape women’s lives, challenging us to reevaluate and re-imagine the world in which we live. HerCircleEzine.com was founded in 2005 as an online literary magazine. Since that time, the scope of the magazine has expanded to include journalistic coverage of writers and artists engaged in socially and politically aware creative practice. In addition, the magazine features a series of blogs and other online media. Trailer: Undocumented, a play by Katherine Chua from Kat Chua on Vimeo. 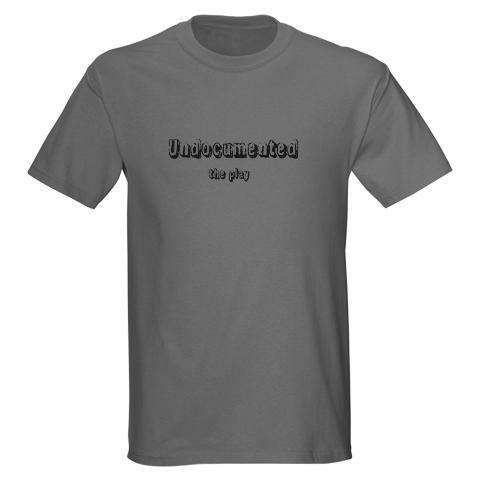 Click Here and Go to Cafe Press and get your Undocumented T-shirt! Last night the cast performed the show sans any multimedia: no sound, no projection. They were brilliant! Temesgen performed the Obama monologue brilliantly. They owned the small 11×16 stage! David directed brilliantly and worked the light switch amazingly. We are READY to go on the road! Quick someone invite us! Undocumented will be performing at American Theatre of Harlem’s Seasons One-Act Festival! Tickets are $18, it includes a Yusef Miller’s “Breakfast” and a one-man by Antonio Lyons.